Brighton & Hove Albion boss Sami Hyypia admits the injury that has sidelined winger Solly March so far this season remains a mystery. The 20-year-old, who played 28 matches last season after making his first-team debut in August 2013, has been forced out with an unidentified back problem. "I don't exactly know what his problem is," Hyypia told BBC Sussex. "For a player that is very bad. If you don't know, then you can't really say the exact time that he will be back." Former Liverpool defender Hyypia continued: "For a player it is the worst situation you can have. "You want to be back as soon possible. If they can say it will take six weeks or seven weeks then it is easier to work in the head as well. "We are doing everything we can to find out what really is wrong and work on that." 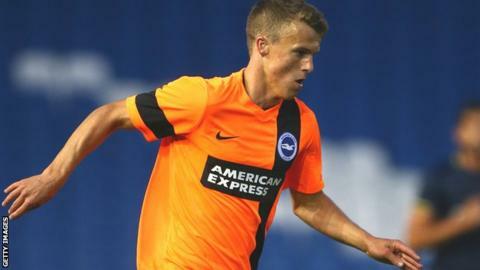 England Under-21 international March, who was previously on the books at Chelsea before joining Brighton from Lewes in 2011, extended his contract with the Seagulls until 2018 in April. Meanwhile, Hyypia praised defender Lewis Dunk after the 22-year-old made his first Championship start of the season in Tuesday's 2-0 win at Leeds United. Victory at Elland Road was Hyypia's first league triumph as manager in English football. "He is a centre-back who can play good football as well," said Hyypia. "When we work on his decision-making, more that he is consistent in every game, then he can have a great career ahead of him. At that age he can only learn more and more."